In 2015 we already went to the Sonian Forest with the dalmatian club. We had a numerous attendance of happy owners and exuberant spotted friends. Even the sun showed up, but actually this is starting to be a tradition on the 1st of May: shining weather. Will you be joining this years edition? We will walk approximately 7km trough the forest and enjoy the sight of small paths, with or without mud, beautifull tree lanes and outstretched lawns. 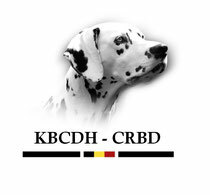 The dogs can indulge themselves fully and the owners can enjoy the sight of so many running and playing dalmatians. Afterwards we'll have the opportunity to rest and fill our starving stomachs at Cafétaria De Bosuil with a pasta and salad buffet for the price of 16€pp, drinks not included. Video impression on Facebook and pictures online!